It’s about that time for Happy Hour at Faultline! July 28, 2015 July 31, 2015 ~ Trevis Dampier Sr. Native Americans made a corn beer long before Europeans found their way to America, bringing with them their own version of beer. Although most of that was brewed in the home during the seventeenth and eighteenth centuries a fledgling industry began to develop from 1612, when the first known New World brewery opened in New Amsterdam (now Manhattan). The “modern era” of American beer began in the nineteenth century. In 1810 only 132 breweries operated and per capita consumption of commercially brewed beer amounted to less than a gallon. By 1873 the country had 4131 breweries, a high water mark, and in 1914 per capita consumption had grown to 20 gallons (compared to about 21.5 today). Then came national Prohibition. It’s hot out here in the Bay Area and I need something ice cold going down my throat to calm down this fiery sun breathing down my neck. Maybe an ice cold glass of cool water.. Better yet, a soothing cold glass of coke a cola with that great fizz down my throat..
How about a nice ice cold sizzling brew going down my throat..
Let’s talk Faultline Brewing Company.. Happy hour at brewing companies are great because it gives you an opportunity to try out all of their delicious brews while enjoying some of their appetizers as well. Faultline does great with their happy hour by having an absolutely beautiful scenery inside and outside of their extravagant palace of delicious food and brew. Virginia and I decided to order a couple of appetizers and enjoy a couple of their IPA’s. The IPA’s were awesome a perfect hoppy blend with a touch a citrus to your lips as well. 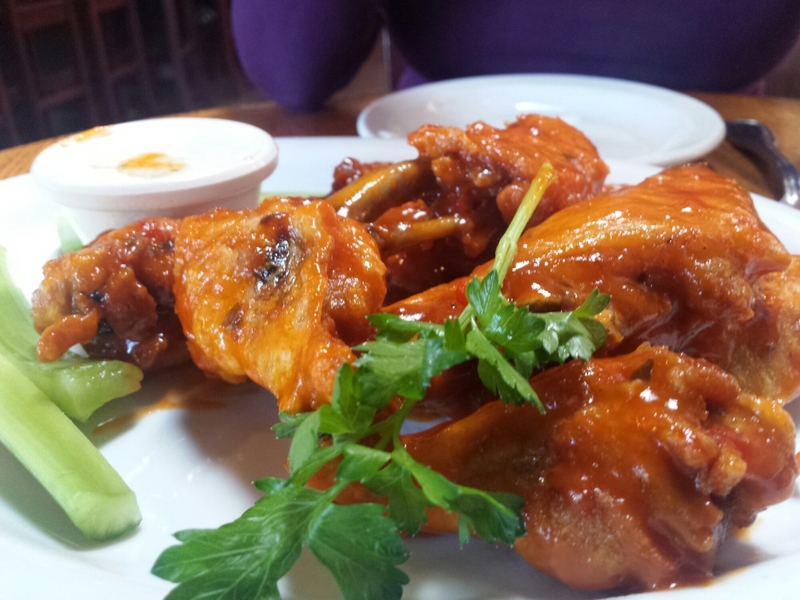 Then comes out these shiny, bright ,sun glistening Thai Chili Wings e ordered. These scrumptious delights were picture perfect and I couldn’t wait to dive right in. Without blinking, I instantly found my fangs into the leg of these little masterpieces of heaven! First of all they were perfectly fried so not too crunchy but enough crunch to count and the sauce it was smothered in was just divine. Sweet, slightly spicy, great texture and great flavor! Highly recommended! Then the Excalibur of ribs came into the room. It felt like silence entered the air as the waiter laid them on the table. I could smell the smokiness coming off the ribs before they even hit the table. 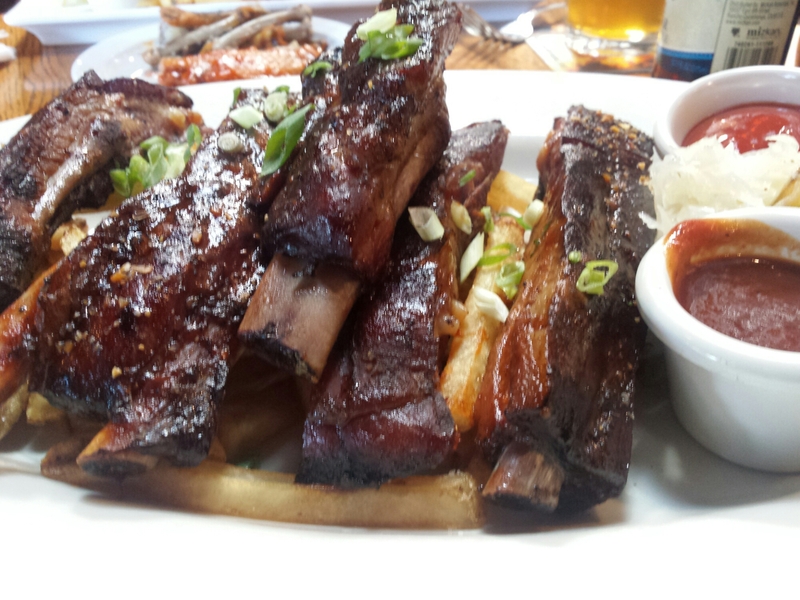 I immediately dove in and let me tell you; these ribs we’re cooked and seasoned to perfection. They should win an award for these things! Tasted so good my leg was twitching underneath the table! The barbecue sauce was spicy, sweet and finger licking good as they enhanced the bite to the 10th power every time I poured some over these succulent delights! Bite after bite..Moan after moan!! True live action eating! Good job Faultline! If you have never been to Faultline Brewing Company then I suggest you go soon. I promise you that you won’t be disappointed! < Previous Chinese Fast Food at it’s Best at Panda Express! Next > You’ll need a go-cart to make it around the Festival of the Arts!